I decided to share some of the wishes he has received in honor of this milestone, we should all be so fortunate to be viewed in such a positive light. Just look at that smile! Archbishop Emeritus Desmond Tutu: The greatest gift the nation could give Mandela on Wednesday would be “to emulate his magnanimity and grace.” “Mr. Mandela taught us to love ourselves, to love one another and to love our country,” Tutu said. Life With The Top Down: Nelson, I wish you nothing but joy on this very special occasion. The lessons you have set through example have eternal life. Everyone who knows your name has been inspired by your words. You have made your mark in this world by living your life beyond measure, by doing for others. Thank you for being you Nelson! 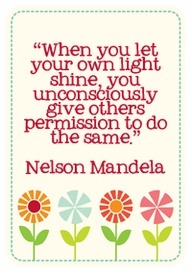 This is my favorite quote from Mr. Mandela. It really is the secret to living in a peaceful world. 94 years of making this world a little brighter for all us to … Enjoy the Ride! Well said. Thanks for posting this. A fitting tribute to an amazing human being. Nicely done. Beautiful. Happy Birthday to a beautiful man. I absolutely, hands down genuinely love this man’s spirit.. All those years in jail, he walks out a peaceful, loving man.. Thank you for posting this about my friend whom I’ll never meet but admire forever!!! Seriously the best human being on the planet! There must be something to it, because he looks pretty dam good for 94! Happy Birthday to one of my heroes! I loved this post in commemoration! 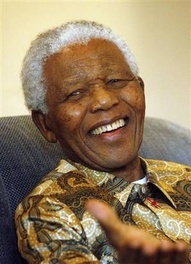 Happy Birthday Mr. Mandela! I have tweeted and facebooked this post – thanks for writing it! Thank you ands thank you for stopping by! Reading all those beautiful sentiments really put a smile on my face yesterday! Wisdom, compassion, dignity and humanity all in one package. Great post. One of the truly great men of our times — and there are so few! So very true! Thanks for stopping by. I love your history lessons and me and Mr. M. are both born on the same day, something I didn’t know. I love the quotes and messages to him. Thank you so much for enlightening always. Happy Birthday…You are indeed in good company! And I thought it was just me and Red Skelton. Great post. I was once in an airport and saw Nelson Mandela walking towards me. I was so flustered I had no idea what to do, when he saw me staring he walked by me and said hello—a moment to treasure. Reblogged this on Jeff Burns Pages. 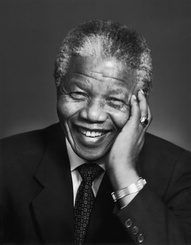 This post was originally written in honor of Nelson’s 94th birthday, today it is reposted in honor of a life that exceeded the expectations of mankind. The world may be a little bit dimmer today with the enduring loss of Nelson Mandela, but his light will shine on through all he has touched … thankfully that number is unable to be measured. What a lovely tribute, thanks for reminding us. I don’t think we will see another like him again. He was a great man and the world will miss him. What a fitting tribute of a post. All our lives will be diminished by the loss of this wonderful man. ciao! his light does shine on. Might have to put that smile on my desktop.